Most everyone knows that an A.A. meeting is due to the mention in movies, TV shows, books, and more. According to the NCBI, Alcoholics Anonymous began in 1935 and has grown to become the most popular self-help organization in the world. But where did it start and how did it become what it is today? The history of Alcoholics Anonymous is an interesting read to anyone who is, has, or will attend the meetings and wish to know the origins. The A.A. group was founded by a religious movement named the Oxford Group, which was a popular movement in the United States and Europe during the 20th century. The members of this group began a formula to help those suffering from alcoholism by creating a practice that allowed the members to continue their treatment after they had gone through rehab. This program would provide self-improvement by allowing the individual to talk about their self-confidence, past wrongs, and make amends by using prayer and meditation to share their journey with others who struggled similarly. According to the White House, as of January 2011, there were almost 108,000 A.A. groups with 2.1 million members in the world to help them to maintain their sobriety using the 12 Steps. 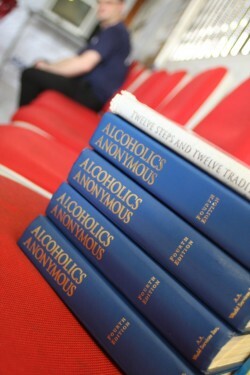 Alcoholics Anonymous was founded by the Oxford Group in the 20th century. Rowland H, an upper class man rom Rhode Island, visited Carl Jung, a Swiss psychoanalyst to seek help with his alcoholism in the 1930s. When Jung told him it was helpless unless he sought spiritual relief, he was turned to the Oxford Group. Along with his friend Edwin T. (nicknamed “Ebby”) from Vermont, Rowland entered the group and was finally able to remain sober by practicing the methods taught by the Oxford Group. Bill W. was a favorite among the big cats of Wall Street but his career was ruined by alcoholism. He grew depressed when he learned that his condition was seen as hopeless by the locals but he sought medical treatment anyway in Manhattan. He did not stop drinking until Ebby came to him with the story of the Oxford Group and invited him to join. With the Oxford Group’s methods, Bill was able to free himself of his depression and despair, and he was able to remain sober as he reached out to other alcoholics. He worked hard to help any alcoholic to reach the same peace through sobriety offered by the Oxford Group. With the word of mouth spreading, the roots of the Alcoholics Anonymous had begun to grow. He met with a like-minded doctor from Akron and together they created what is now called the “12 Step” recovering program. In 1936, the owner of Towns Hospital made the suggestion that Bill move this new practice to the hospital to treat alcoholics with the profits of the establishment to support him but he refused, insistent that this group was non-profit. Alcoholics Anonymous has grown since its inception in 1935 and has helped millions of people not only from the United States, but also from around the world. From the first alcoholic that was introduced to the Oxford Group to the New Yorker who wrote the 12 steps to recovery, A.A. has grown into a program that has helped many people to become sober and to maintain their sobriety to achieve peace in their everyday lives. If you or a loved one is suffering from alcoholism and needs help, call 800-653-7143 to speak with a caring specialist that can assist you.